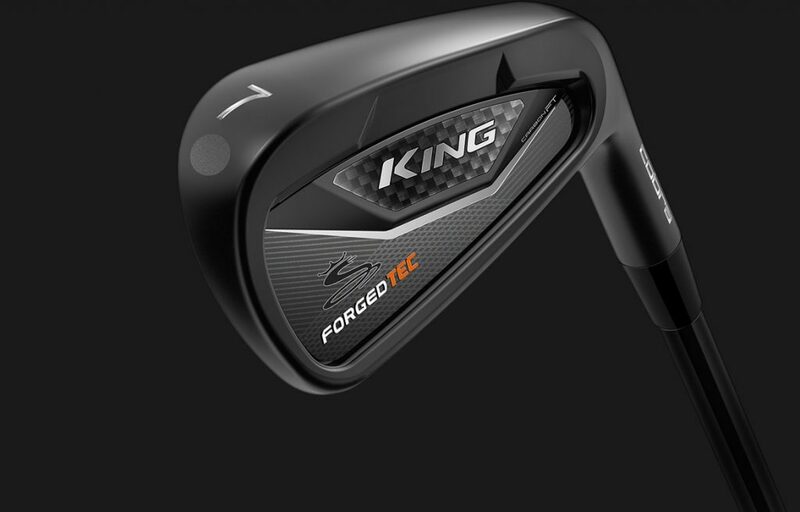 After a little time away, Cobra brings back the KING Forged TEC iron, this time in a sleek black finish. The Cobra KING Forged TEC Black irons are perfect for the low-to-mid handicap player looking for some distance and forgiveness. The changes to these irons go beyond the looks. We peel back the outer layer and show you the inner “beauty” of these irons. 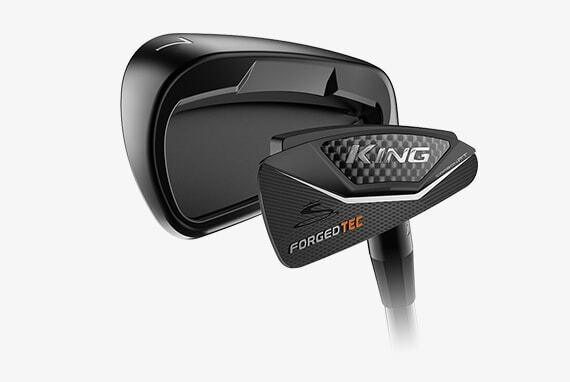 As mentioned above, the obvious change to the KING Forged TEC Black irons is the finish. Cobra uses Diamondized Black Metal (DMB) technology to give the irons a black finish that’s durable and doesn’t give off a glare. 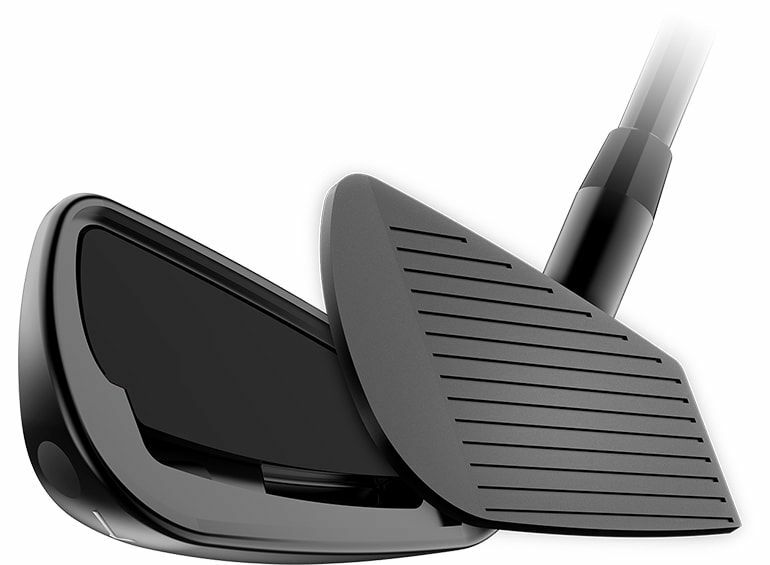 The black color gives the club head a smaller, compact look at address, appealing to better players. The color extends beyond the club head too. The stock True Temper AMT Tour White shaft comes with a black PVD finish. In graphite, the stock UST Recoil 780 ES SmacWrap shaft has a matte black finish. More on these shafts shortly. The top line is moderately thin, aided by the black finish. There is also just the right amount of offset that appeals to mid-handicap players and won’t scare away the low-handicap players. The original KING Forged TEC irons had a J15 high-strength steel face. This steel lowered the CG and gave the clubs high launch with low spin. 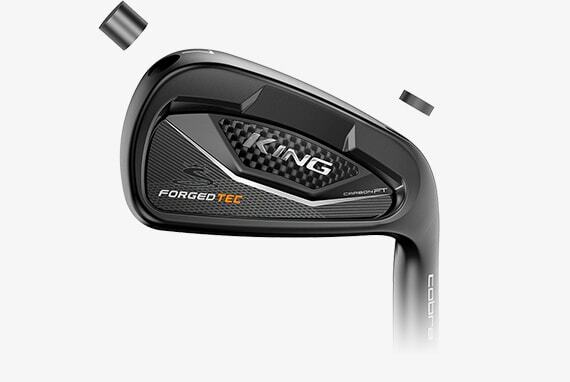 Looking for improvements, Cobra switched to using a forged 4140 Chromoly Steel face in the KING Forged TEC Black irons. This steel is more wear resistant and durable, keeping the black finish longer. Chromoly steel is also stronger than the J15 steel. This let designers forge the face thinner, giving more ball speed and distance across the face. A new carbon composite badge on the back of the KING Forged TEC Black irons dampens vibrations at impact. The resulting soft, solid feel lets you know when you’ve flushed it while still providing feedback on misses. Better players use that feedback to detect and make adjustments. Also adding to the feel are tungsten weights in the heel and toe of each iron. The weights keep the CG low and centered so your good shots feel even better. The weights also increase the forgiveness by placing more weight on the outside of the club. The final major change of the KING Forged TEC Black irons is the inclusion of Cobra Connect, powered by Arccos. Cobra fans are familiar with this technology offered in the KING F7 and KING F8 drivers (also the KING F8 fairway woods and hybrids). 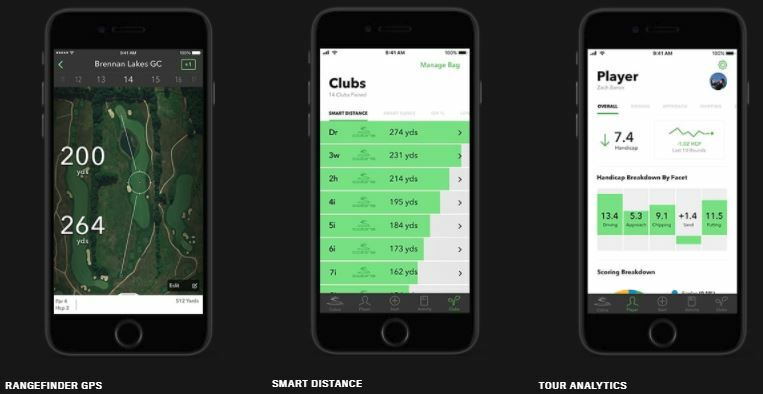 Paired with the Arccos app, it tracks average distance, accuracy, GPS and more. This is now extended to the rest of your bag. As mentioned above, the stock shafts are the True Temper AMT Tour White (steel) and UST Recoil 760/780 ES SmacWrap (graphite). The AMT has a lower launch and spin. The weight of these shafts increases as the clubs get shorter. This makes it easier to hit the long irons and gives more control when using the short irons. The Recoil shaft has mid-launch, mid-spin properties. 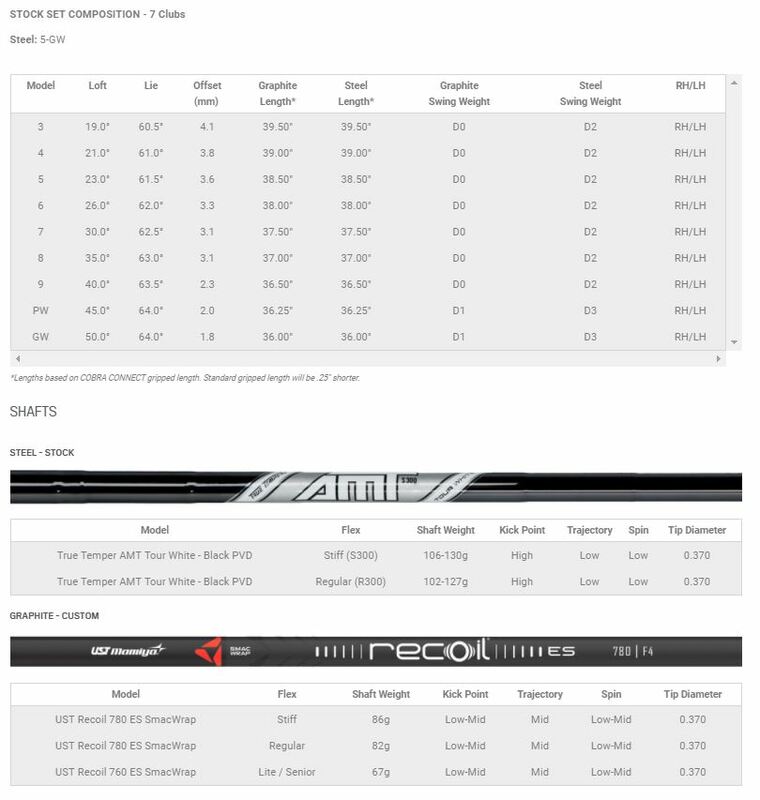 The chart below gives more details about the shafts and shows loft, lies, etc. of each available club. 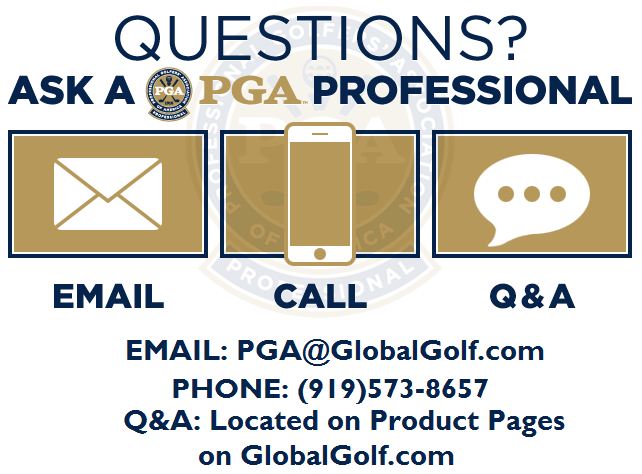 Note: These irons are available in traditional lengths as well as One Length, where each club is the length of a 7-iron.